Whether you’re Warren Buffett or a brand new investor, spotting opportunities to invest in companies at a discount is key to success in the stock market. Value investors know that market prices do not always reflect all available information on a company, and that discrepancies can exist between market pricing and the actual fair value of a stock. But finding companies that are undervalued by the market, and identifying them before the rest of the market jumps on board is another animal altogether. Unlike Warren Buffett, most value investors don’t have access to automated investing platforms, or insider connections at some of the largest companies in the world. So, the question is... how can you compete and win in the stock market by finding undervalued stocks that deliver big returns? If you have a knack for spotting value, and are motivated to take your stock market investing to the next level, then this is the article for you. Value stock screeners and other tools for value investors that will help make your life easier. OK, maybe that isn’t an old saying, and maybe the first time I’ve heard it said was when I wrote it down, but it remains true all the same. Value investors don’t approach investing as a get rich quick scheme, and they don’t buy stocks based on advice from their cousins uncle, who heard that a stock is going to double over the next six months from their sister in-law’s best friend. Successful value investors take an in-depth approach to finding and investing in stocks, and approach investing in stocks with a long-term perspective. As we cover in greater detail in our article over fundamental analysis, a key element to all value investing strategies includes a belief that over time, a stock’s market price will ultimately gravitate towards its fair value. Since you know this, you can take advantage of inefficiencies in the market by buying stocks that are priced below their fair value. Your goal is to identify these stocks and ride the wave as they trend upwards towards their higher fair value. That sounds good… but how do you know when a stock is undervalued? So, we know that being a value investor isn’t easy, but the pay-off can be significant when done correctly, what next? Performing financial analysis and analyzing a company’s fundamentals are at the core of identifying and investing in undervalued stocks. This often time takes the form of a detailed financial statement analysis, a deep dive into a company’s financial ratios, or researching macro economic trends that could signal future growth in a company’s industry or sector. Analyzing a company’s financial ratios can lead to unlocking key insights into a company’s potential for growth and their current competitive positioning. In our article covering the 5 step framework for effective financial ratio analysis we break this down in more detail, but knowing a company’s historical results and where its been, can lead to a better understanding of where the company is heading. A deep understanding of the company and its key performance metrics (KPI’s), along with knowing how a company stacks up against its peer group and competitors, is a vital step in finding undervalued stocks that will lead to big returns down the road. These metrics are the tip of the iceberg when it comes to identifying undervalued stocks. Identifying indicators that a company is undervalued is part science and part art, and can vary from company to company. Using an effective value stock screener, and other research and analysis tools can simplify the process of identifying these metrics and finding value investing ideas. We’ll be covering these tools for value investors shortly, but before we do, let's talk a little bit about how these indicators and metrics can be used to identify undervalued stocks. There is a lot of data out there on public companies. The Securities Exchange Commission requires companies to report certain metrics and disclose certain items to investors on an interim and annual basis. Value investors realize the benefit of this by using the information to analyze potential investments and monitor ongoing investments. These reports are required to be filed by publicly traded companies on an annual basis. They provide significant details about a company, and not just financial details. Reviewing a company's annual report can tell you more about the potential risk factors of a company, potential commitments and/or contingencies that may impact future results, and much more. Reviewing these reports takes a lot of discipline, but for evaluating the metrics that a company’s management team determines is important, there is no better source. Investors generally don’t enjoy reading through these reports... and who can blame them! Annual reports are dense, and depending on the company, reading through all of the fluff and disclosures in order to find the information that interests you can be about as fun as a 6am trip to the dentist. Another way to track market movements and company data is to follow market analysts and other “experts” who cover the company that interests you. A quick Google search will tell you, there will be at least one person that has an opinion on pretty much every publicly traded stock. Using the information provided by these individuals can have a positive or negative impact on your analysis, depending on the source of your information. It is true that analysts generally have a pulse on the market, and are aware of breaking news and market trends very quickly (after all, it is their job), but that doesn’t mean they should be blindly trusted. There’s a reason almost 22,000 people search for “best stocks to buy now” on Google each month - they want someone to tell them which stocks to buy, rather than perform their own research. There is also a reason why most people who blindly follow an analyst or expert recommendation don’t end up experiencing long-term gains in the stock market. Reading an analysts list of stocks to buy can give you a starting point for further research and analysis, but always make sure you’ve done your own due diligence before investing in a stock. If you’ve been in the investment game for more than a few minutes, you know there are a lot of websites out there that provide information on stocks. The primary websites you may be familiar with include: morningstar.com, yahoo finance, and marketwatch.com. If you’ve used these tools to analyze stocks, you may also be familiar with constant ads and slow speeds, which can make completing your analysis a time consuming project. It is possible to get a full picture and understanding of a company by bouncing between the different finance sites, but from my experience, this process is slow, and data that I thought was important was missing from several of these sites. Another point of frustration for value investors using these sites for investment analysis is that most of these websites are focused on providing tools and data for technical investors. While technical indicators can be important, the data required for value investors to complete fundamental stock analysis is different that what a technical investor would require. Finding the necessary information to evaluate a company before investing can be difficult and consolidating this information and calculating the important company metrics and trends from this data can be just as hard. If you’re a microsoft master, formatting and performing calculations on large data sets is possible in excel, but for most investors, this turns into a time waster, which takes you away from your most important objective - actually analyzing the results of those calculations. This can be the same for value investing if you take a manual approach to your analysis. When it comes to value investing, there are no shortcuts to fully understanding a company and evaluating potential investments. There is no replacement for knowing the underlying factors that have the most impact on the performance of the company. Obviously, getting to a point of fully understanding a company takes time and can be a tedious process. Maybe it was just me, but when I analyzed stocks this way it could take forever to identify potential value stocks to invest in, and then analyze each of those stocks. Here is a quick rundown to give you an idea of how we use these tools to effectively and quickly search for, and analyze potential investments. Before beginning a search for stocks that could be undervalued, you have to know where to look. Knowing where to look means knowing the criteria that matters to you, and to the companies that you invest in. There they are - the ones that passed your first test and made it to the second round of analysis. If your criteria returned too few, or too many stocks, you can remove or modify your criteria until you end up with a list of companies that interest you and have the fundamentals that you are looking for in a potential investment. With your list of potential stocks in hand, you can press forward and begin analyzing each of these stocks individually. If you’re investing in a company, you want to know more than just the basics. You wouldn’t marry someone after your first date (or maybe a few of you would...), so why would you invest your cash into company that you don’t know or fully understand? What’s their story? Where are they located, how many employees do they have, and what do they do. Are they innovating and actively engaging with customers on social media and other platforms? Who’s manning the ship? Do they have the right management team to deliver strong growth and returns to investors? What’s revenue been doing over the last few years, and if sales are growing, are they managing margins and costs so earnings and EBITDA are trending upwards along with it? 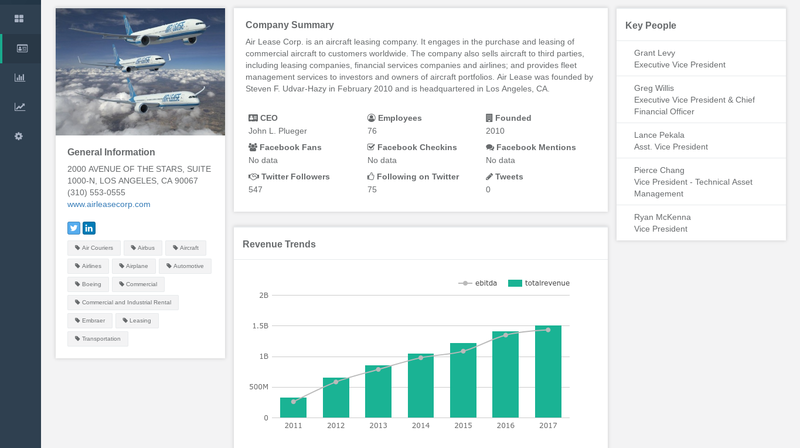 Second, after knowing the basics, it's important to dig deeper and see how a few of the company’s key operating metrics are trending over time. For most companies, there are over 200 metrics that you can chart with the click of a button. Knowing how a company’s results are trending over time, can be a good indicator of the company’s potential for future growth. AL vs. ARII using DiscoverCI.com's benchmark charting comparison tool. You want to invest in the best. Investing in a great company that consistently is outperformed by its competition will most likely result in low, or negative returns on your investment. That’s why knowing where a potential investment stands relative to its peers is a key part of effectively analyzing a company. Once you’ve done this for one or two companies, your analysis goes quickly and you can rinse and repeat for each of the companies on your list. 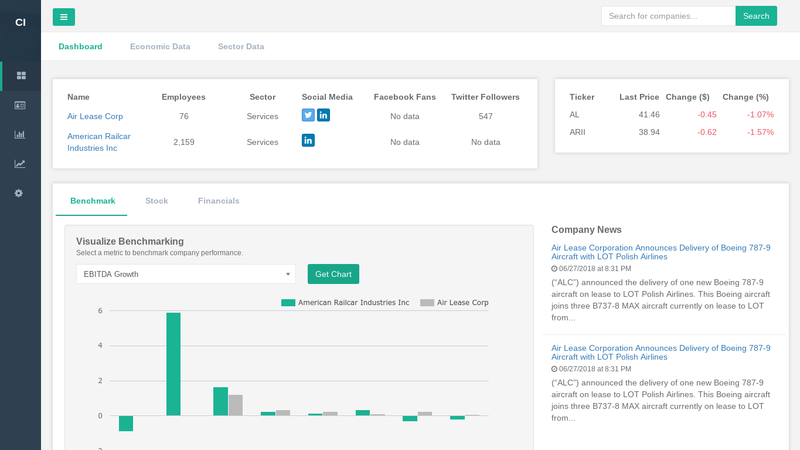 For those companies that you want to follow and track further, add them to your follow list so updates and company news will be waiting for you on your dashboard. You can also use the quick charting tool to benchmark the companies you follow against one another. Obviously, searching through websites, and charting the information within excel or other offline tools to complete the above steps would take some serious time. If you’re interested in trying out the tools for yourself and experience how they impact your value investing analysis, sign up for a Free 7-Day Trial. Finding and analyzing stocks that meet the criteria of value investors can be difficult, but those investors who master the process can see big rewards for their effort. There’s a big difference between value investing stock screeners and stock screeners designed for investors who don’t incorporate fundamental metrics into their stock investment strategy. You can use value stock screeners to hone in on the company metrics that are important to you, and cut down on the time it takes to find potential investments. The right value investor, with the right tools, knowledge and disciplined approach can increase their investment returns and lower their risk in the stock market. 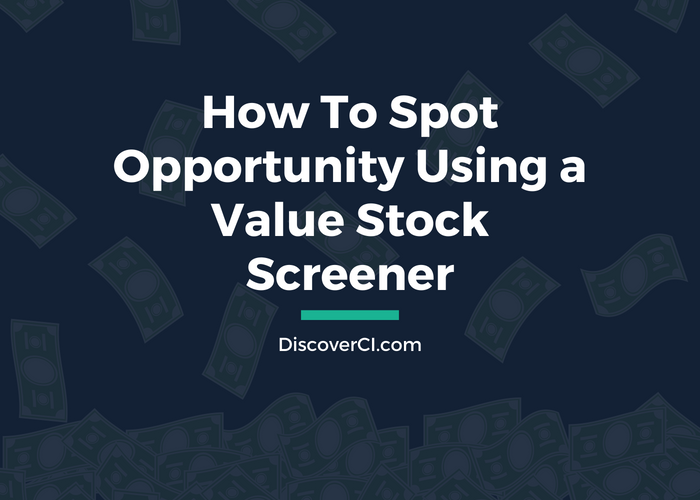 You can find and analyze stock data using the free methods described in this article, or sign up for DiscoverCI and let us take care of the dirty work for you. With DiscoverCI, valuable information and analysis tools are all at your fingertips. Whichever method you use, just be sure to employ a detailed and educated approach to investing in the stock market and you will enjoy the rewards.